Pecan Place is a cosy modern guest house situated in a peaceful residential area, in the Pretoria Moot Area, on the slopes of the Magalies mountain. Self-catering accommodation is provided in three well-equipped suites, suitable for both leisure and business travellers. Microwave oven, fridge and kettle are provided. NO stove. 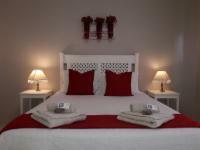 Guest suites are furnished with either twin or double beds, have en-suite bathrooms and kitchenettes with all cutlery and crockery provided. Each suite has a wall mounted TV with full DStv channels and there is free Wi-Fi access. Weekday room service includes making of beds, cleaning floors, bathroom and washing the dishes. The property includes a private garden for guests with braai facilities. There is a wide selection of shops and restaurants all within two kilometers from Pecan Place. The Hosts and venue was outstanding. Wonderful people as well as the venue. Pecan Place is 0.7km from the centre of Waverley (Pretoria) , the nearest airport 14.4km (Waterkloof AFB Airport).